Why buy High Strength CBD Oil (4%)? Most people have heard of “hemp oil” but not CBD oil. CBD Oil is extracted from industrial hemp, which has no psychoactive effects and is perfectly legal. 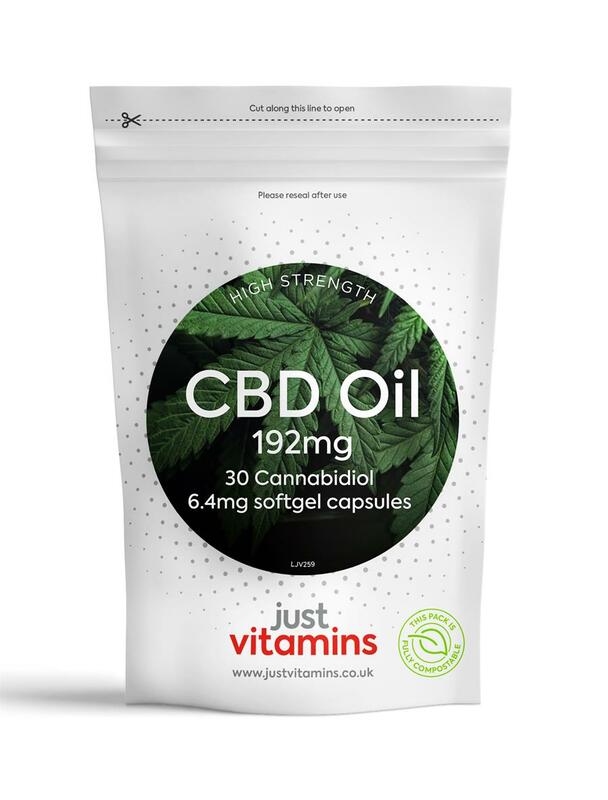 Try our Super Strength CBD Oil capsules yourself to see why they are rapidly becoming our most popular supplements in years. Cannabidiol (CBD) is a compound derived from the hemp and cannabis plants. But let’s clarify this – although hemp and cannabis are from the same Cannabis Sativa L. family, their chemical composition is different. This CBD Oil is extracted from agricultural hemp, which has no psychoactive or addictive effects, and is perfectly legal and safe to take.It is believed CBD Oil acts on the endocannabinoid system in our bodies, and much of the current scientific research focuses on the benefits this non-intoxicating and safe compound can have in our well-being. Fortunately, we operate in a heavily regulated industry that leaves no room for misleading promises, and part of the legislation we firmly abide by means we are not able to make health claims for CBD Oil at present. This is a new ingredient to the UK, so we cannot relay details to the public about relevant scientific research either. We however encourage you to research CBD for yourself. Why choose our High Strength CBD Oil? Our reputation is key to our business and we always aim to ethically source the best quality ingredients for our supplements. Our CBD Oil is obtained from hemp plants cultivated without the use of herbicides, pesticides or chemicals, grown legally in EU under license, with all batches traced back to their field. This CBD Oil is extracted from the leaves of the hemp plant using non-toxic CO2. This is the cleanest and safest extraction process, as it interferes as little as possible with the cannabinoids and harnesses most of the plant’s beneficial compounds. A full decarboxylation process is used, where the inactive CBDA or cannabidiolic acid is transformed into active CBD, resulting in a high-potency product. The oil is then purified and batch tested to guarantee the highest levels of CBD and no impurities or THC, ensuring it is 100% safe to take. Finally, the addition of food grade hemp oil increases its absorption in the body. Not only this, our softgel capsules dissolve directly in the intestine, resulting in optimum absorption of the product. If you are new to CBD Oil, it is advisable to start with a low intake and build gradually during the course of a few weeks, until you find the level that best suits your needs. Remember, we are all different and can react to supplements in different ways. If in doubt, low and slow is best. Looking for a higher level? Our High Strength CBD Oil 6.4mg capsules are available in packs of 30s and 60s, containing a total of 192mg and 384mg CBD oil per pack respectively. If you are looking for a higher strength CBD Oil, why not try our Super Strength CBD Oil 480mg to 960mg? This product should not be taken by anyone under the age of 18. Keep out of reach of children. Bulking Agent (Olive Oil), Bovine Gelatin, Glycerol, Hemp Oil Extract. Adults: Swallow one to three capsules daily with water. For optimal results, best taken at regular intervals throughout the day. If you are new to CBD Oil, it is advisable to start with a low intake and build up gradually during the course of a few weeks, until you find the level that best suits your needs. Remember, we are all different and can react to supplements in different ways. If in doubt, low and slow is best.